The Taliban quickly responded to Afghanistan President Arshaf Ghani’s roadmap for peace, which was laid out at the Geneva conference today, and its position is more than predictable. The Taliban yet again belittled the Afghan government as a “powerless and foreign imposed” regime that is unworthy of sitting down at a negotiating table. In a statement released today on Voice of Jihad, the Taliban made its position on peace talks quite clear. Ghani was not described as the president of Afghan government, but the “head of Kabul administration.” The Afghan government, which the Taliban refuses to recognize as such, is “powerless and foreign imposed” and negotiating with it is “a waste of time because impotent sides do not possess the capacity of making decision [sic].” Ghani made proposals, the Taliban claimed, that are “beyond his capabilities” as the US is the real power behind negotiations. Additionally, the Taliban noted that it is “fighting and negotiating with the American invaders for the success of Jihad.” In other words, it is waging a religious war to oust the US and what it perceives to be imposed Western-styled democracy. 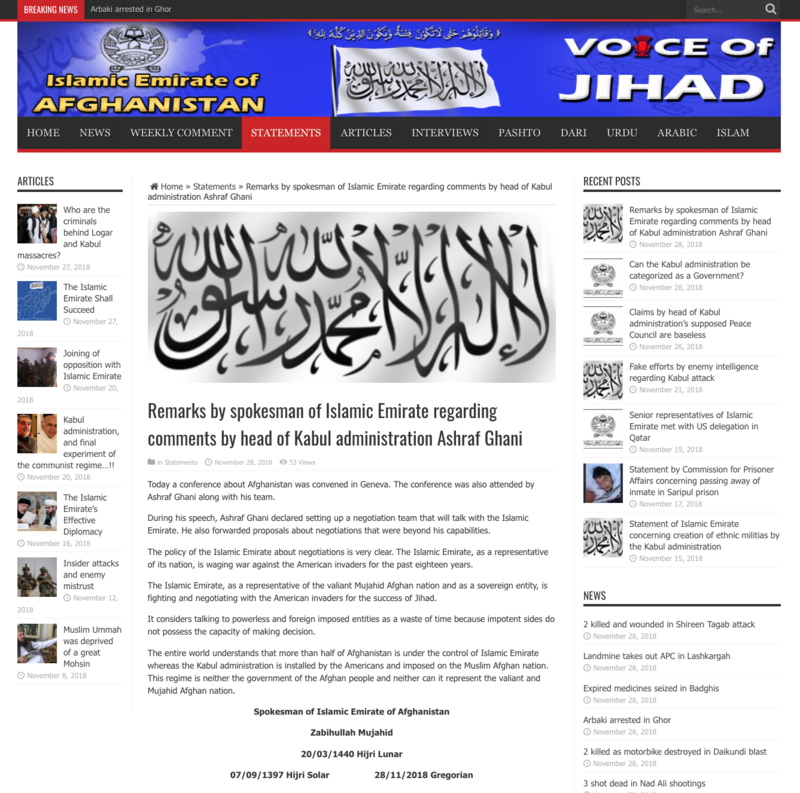 The Taliban called the Afghan government and its constitution un-Islamic and has said only the Islamic Emirate of Afghanistan has the religious authority to rule the Afghan people. 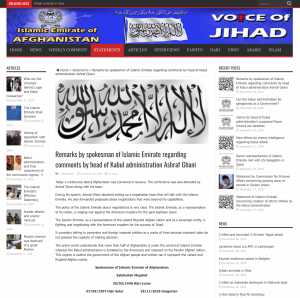 The statement, which is reproduced in full below, is the latest in a series of Taliban statements that detail the group’s position on negotiations and “peace” in Afghanistan. The Taliban has consistently maintained for more than a decade that it refuses to negotiate with the Afghan government, nor will it share power with it. It insists that peace will be achieved once the US and NATO withdraw their forces from the country. Again, the Taliban’s response was entirely predictable. FDD’s Long War Journal noted earlier today that the Afghan government’s position on negotiations is completely at odds with the Taliban’s views. The latest statement by the Taliban merely reinforces these fundamental differences. Today a conference about Afghanistan was convened in Geneva. The conference was also attended by Ashraf Ghani along with his team. During his speech, Ashraf Ghani declared setting up a negotiation team that will talk with the Islamic Emirate. He also forwarded proposals about negotiations that were beyond his capabilities. The policy of the Islamic Emirate about negotiations is very clear. The Islamic Emirate, as a representative of its nation, is waging war against the American invaders for the past eighteen years. The Islamic Emirate, as a representative of the valiant Mujahid Afghan nation and as a sovereign entity, is fighting and negotiating with the American invaders for the success of Jihad. It considers talking to powerless and foreign imposed entities as a waste of time because impotent sides do not possess the capacity of making decision. The entire world understands that more than half of Afghanistan is under the control of Islamic Emirate whereas the Kabul administration is installed by the Americans and imposed on the Muslim Afghan nation. This regime is neither the government of the Afghan people and neither can it represent the valiant and Mujahid Afghan nation. American invasions to install their type democracy, their will to fight, their half baked foreign policies, their struggle to save face when all is lost, their indifference towards innocents, and their over confidence at the start of ‘battle’, have all contributed to their defeats starting from the Korean war, to an extent, but definitely from Vietnam onwards. On the other hand they have forced their corrupt puppets to governance in countries they have invaded – Thien in South Vietnam, Karzai in Afghanistan, Maliki in Iraq, and the various dictators they have supported all round the world have all contributed to the origins of the ‘circus’ they now are. Blame everything (and anything) that goes wrong in this world on da’ gubba Mint (as long as it’s the US gubba Mint). Can I just say, as an old Afghan-head I’ve thoroughly enjoyed reading this journal for a long time; almost since the long war began. I’ve been informed and kept up to date by its diligent reporting, insight and access to information. And would like to compliment Bill Roggio for his expertise and unparalleled and excellent work all these years. Given that the Afghan government is one of the most corrupt governments in the world and has been almost from its start, perhaps the Taliban are right!! Richard, don’t believe everything you read or hear in those media mob retorts. Are you looking for a ‘Hail Mary’ play in this thing, CIA? I say it again. Go after the opium trade. Just follow the opium trail. Everything you’d ever need to know about the Taliban and then some will be contained therein. If done right, I honestly believe that it will yield an intelligence bonanza on both ends of the pipeline, including [but not limited to] valuable intel on both ISIS and AQ. Use the resources at DEA or whatever it takes. It sure seems to have worked in Columbia. How true it is. They predicted in the wake of the 9/11 attacks that the WOT would be like the war on drugs. This will require legalization of the drug and control of the borders. If you allow a large legal trade you will at the same time facilitate illegal trade expansion. The price would drop because the supply would increase. Farmers would supply both legal and illegal markets. Competition between legal and illegal growing space would hurt food crop production as if five droughts hit at once. Legality of the drug would make it harder to interdict its cross-border movement. Look at medical marijuana in the states. I am willing to bet both Dostum and Hekmatyar would love this idea. I know your idea revolves around legalizing the drug to grow for export and buying from farmers for the market of the world but that’s about all I know. What am I missing? Hello Irebukeu, thank you for your comment. I think you may be misunderstanding what I’m saying. Allow me to clarify. I’m not suggesting the legalization of heroine. What I’m suggesting is why not convert the opium that is currently being used in the black market heroine trade into legal pharmaceutical grade methadone? That’s just a suggestion. At least arguably, the current opium production is the primary revenue source for the Taliban. And that just covers the Afghanistan end of the pipeline. If Kabul regime is not powerless and foreign imposed, it should demonstrate it, and its simple. Exit all the NATO and US invaders from Afghanistan, and then ask Taliban to talks. Its simple logic. If Kabul regime cant do that, well then the Taliban are right – its impotent and have no authority. And why the hell to talk with someone who has no authority to do something. That’s really a waste of time. Murad, when are the Taliban going to tell all of those puKKKin rejects to go back to the Russian Fed where they came from, in addition to all of the other prostitutes, rejects and nut cases they’ve imported into Afghanistan to swell their ranks? I mean, who are the real ‘occupiers’ in Afghanistan? If I were a ‘good’ Afghan, I’d accept the US/NATO any day over such. After seventeen years of war in Afghanistan and Pashtoon areas in Pakistan has demaged worsly the region.so,the withdrawal of US forces from Afghanistan will embark a new regional conflict in Afghanisatn by regional players like Pakistan ,Iran ,Rusia and China.The current Chinees and Pakistan strategic partnership will contain Iranian ,Rusian and Indian influence on every price and maximum advantage will be in the goal post of Pakistan because the theo- radical party of Taliban will serve as of the importan and usefull strategic appratus to suppress the nationalist factions of Afghanistan and chiefly the dispute of Durand line between two states.Thus Islamabad will play the role of doplomatic agent of china in kabul and as will as to cut off Indian histrical relationship with Afghans.additionally,Taliban will once again observe the conditionality on non-intervention in Kashgar,in an ethenic conflict territory of Pakistan ‘s friend China and Iranian influence will be halted by the use of anti Shia militant forces in side Pakistan.Resultantly,Pakistan is investing a huge amount of rupees on taliban by providing logistic support ,communication devices,training and arms,sucide Jakets,Sancturies,the treatment of Taliban fighters in Quetta and Peshawer and even Talibans’ wonded fighters are being sent to China through Pakistan.in this case ,it is cleared that the war on terror in Pashtoon territoies was a covert mutul understanding of the USA and Major NATO alloy to deceive the world if the Al Qeda and Taliban are terrorirists then why the are being harboured by pakistan and CSF has been provided to Pakistan?.why the doubl game is being played by pakistan .wether it is being conducted for china to get loin share in Afghanistan and counter India and as welk as to protect Ziangyang and Urmki province of China to achieve inhuman and barbaric hold of Bejing for its assclaimist agenda. Habib, especially for the benefit of our soldiers over there, it would help US out a lot if India would pitch in and help US out in this effort. If the jihadists get their way with Afghanistan, you’d better believe that Kashmir would most likely be next. Instead of complaining about our performance over there, why don’t you (and the rest of India) do something positive about it? In the meantime, I’d suggest you learn how to effectively use a spell checker when posting messages here on LWJ. Yes folks, it’s going to be a long war.